The Wemo® NetCam HD Wi-Fi Camera with Night Vision, F7D7602 is a camera with wireless and HD image capabilities. By using your mobile device to connect via the Wemo NetCam HD's mobile app, you can view your camera anytime, anywhere. 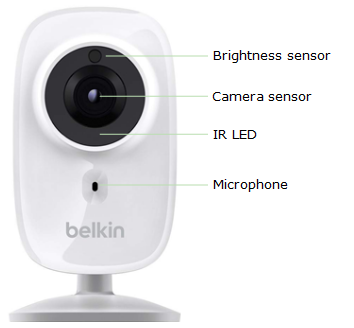 This article will let you know more about the Wemo NetCam HD. Reset System: Press and hold for 1 second to reset the system. Factory Default: Press and hold for 20 seconds to restore factory default settings. Flip up to switch to setup mode. Flip down to switch to camera mode. 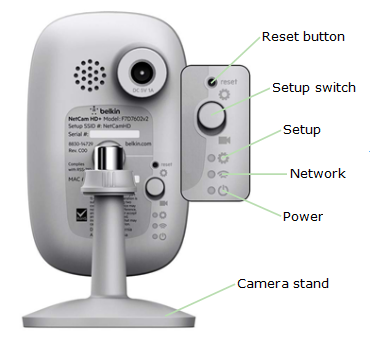 You can adjust the Wemo NetCam HD's position by adjusting the stand.